A Norfolk micro brewery has been told it must change its name or face legal action, because it sounds too similar to the energy drink Red Bull. Redwell brewery, which employs just eight people in Norwich, has been told by the firm its name could "confuse" customers and "tarnish" its trademark. Company owner Patrick Fisher said he was "shocked" by Red Bull's letter and has sought legal advice. Red Bull said it would not comment on a pending case. Mr Fisher said the brewery started up earlier this year and problems began days after it went to trademark its brand, which is named after Redwell Street in Norwich city centre. "We were just shocked. It's been like a dark cloud hanging over us," he said. "Our name is different, our branding is different. We don't make energy drinks and we're not planning to move into Formula One or send a man skydiving from space very soon." A letter from Hansjorg Jeserznik, Red Bull's brand enforcement manager, said the brewery's mark was "highly similar" to Red Bull's earlier trademark of RED and its application covered goods in the same marketplace in which it was competing. 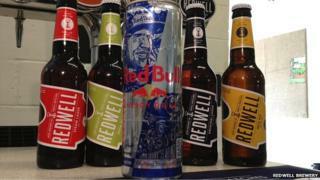 In addition, it said Redwell and Red Bull looked and sounded similar and it was "likely" that customers would perceive the brewery's drinks as an "imitation". Mr Fisher said the brewery, which makes about 5,000 pints of lager and ale every week, had been given until the end of August to come to a resolution. He said: "It's just very sad. We've had a successful launch of the brewery and we just don't know what sort of clout they've got. "But our solicitors have told us we are in a strong position and we hope to reach a settlement."